On May 2, 2018 local time, State Councilor and Foreign Minister Wang Yi held talks with Member of the Political Bureau of the Central Committee of the Workers' Party of Korea (WPK) and Foreign Minister Ri Yong-ho of the Democratic People's Republic of Korea (DPRK) in Pyongyang. Wang Yi expressed that Chairman Kim Jong-un made a successful visit to China this March, and General Secretary Xi Jinping and Chairman Kim Jong-un held a historic meeting. They reached new and important consensus on passing on and developing China-DPRK traditional friendly relations, as well as enhancing strategic communication and cooperation between the two countries, which opened a new historic chapter of bilateral relations. The above consensus reached by the top leaders of the two countries has charted the course and provided the action guide for both sides to consolidate and develop bilateral relations in the new era. Wang Yi expressed that the traditional friendship between China and the DPRK is the common and precious treasure of the two countries. To continuously pass on and develop bilateral traditional friendly relations is a strategic choice of both countries. China stands ready to work with the DPRK to effectively implement the important consensus reached by the top leaders of the two countries, enhance bilateral communication and coordination between political and diplomatic departments, push forward practical cooperation in economy and trade between both sides and activate bilateral people-to-people and cultural exchanges, so as to constantly inject new vitality into China-DPRK relations in the new era. Wang Yi noted that China congratulates on the successful meeting between the leaders of the DPRK and the Republic of Korea (ROK) and its important outcomes. China fully supports the DPRK in finding a development path that is suitable to its national conditions, and focusing on carrying out economic construction. 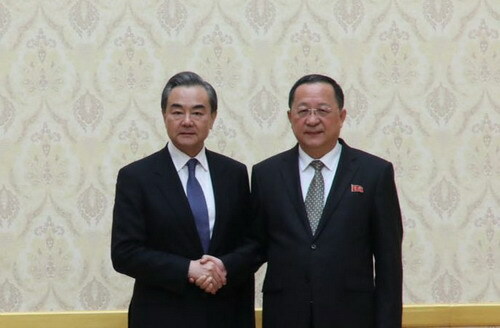 Speaking positively of the positive changes that have been taking place on the recent situation of the Korean Peninsula, Wang Yi said that China fully supports the DPRK's commitment to the goal of the denuclearization on the Korean Peninsula and the settlement of the DPRK's rightful and reasonable security concerns, and gives full support to the improvement of relations between the DPRK and the ROK. China hopes that the dialogue between the DPRK and the United States will be smoothly held and will achieve substantial progress. China is willing to strengthen communication with the DPRK and continue to play a due positive role in the political settlement process of the Korean Peninsula issue. Wang Yi extended gratitude to Chairman Kim Jong-un, the WPK and the DPRK government for their great attention paid to the casualties of the Chinese citizens involved in a recent major traffic accident in the DPRK, and for carrying out rescue operations and medical treatment as well as the follow-up matters with all-out efforts. Ri Yong-ho expressed that Chairman Kim Jong-un cherishes very much the traditional friendship between the DPRK and China. It is an unswerving stance of the WPK and the DPRK government to maintain and well develop DPRK-China friendly relations from a new starting point. The top leaders of the two countries successfully met in Beijing and reached important consensus on enhancing strategic communication and cooperation, which is of milestone significance in the history of bilateral relations. The DPRK stands ready to make joint efforts with China to earnestly and well implement the consensus reached by the leaders of both countries, intensify exchanges between political and diplomatic departments, enhance practical cooperation, push forward people-to-people and cultural exchanges, and make early preparations for well hosting the commemorative activities marking the 70th anniversary of the establishment of diplomatic relations between the DPRK and China next year. The historic meeting between the leaders of the DPRK and the ROK is of great significance. The DPRK stands ready to maintain close communication with China on realizing the denuclearization and establishing peaceful mechanisms on the Korean Peninsula as well as other issues, and continue to strengthen dialogue with all parties concerned. On the same day, Wang Yi left for Mansudae to lay flowers at the bronze statues of the late leaders Kim Il-sung and Kim Jong-il, and visited and paid homage to the China-DPRK Friendship Tower.